The phrase “circuit training” is tossed around a bit in bodybuilding circles, most of the time in a very negative manner. Hey, circuit training is for girls, right? Oh, and old people too! Real men train heavy, using earth-crushing free weights and very low-repetition sets. They spend 4, 5, or even 6 sets at a time on each exercise, and over an hour on each body part. Circuit training is the opposite of that, right? First, let’s define circuit training. You will be completing multiple exercises in a row for one or more body parts. If it’s chest day, circuit training might entail four straight chest movements. If you’re training arms, you might be completing biceps and triceps movements, several sets in a row, with a few minutes’ rest in between the 60 or 80 repetitions. Additionally, you can train your full body using circuit training. You’ll often see elderly or beginner trainers in your gym using this technique. This doesn’t mean it is only effective for them. Rather, they enjoy the simplicity and full-body nature of this training system. Now that we know what circuit training is, let’s examine some times when it can be used beneficially. If you’re a bodybuilder, you might automatically assume there isn’t a time when you should be using circuit training. This isn’t entirely true. If you’re 10 days out from doing a bodybuilding show, you had better believe you will be using circuit training at this point. It’s the only way to keep your muscles hard in these closing days of a die without risking clouding your vascularity (from multiple heavy sets) or risking injury (as you are very susceptible to joint damage with body fat and water levels this low). Additionally, there will always be times where you may be on vacation or crunched for time, when you have to get in a full body workout, just once or twice per week. 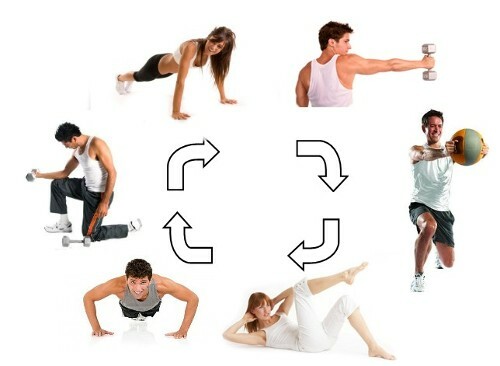 For those times, circuit training is ideal! There are other times when circuit training is not the way to go. Off—season bodybuilders attempting to gain muscle mass aren’t going to benefit all that much from the almost cardio-style training that is circuit lifting. You need higher volume training for each body part to pack the muscle group with blood, rich in amino acids. While any lifting is better than no lifting at all, circuit training isn’t going to be ideal for mass building. When you’re burned out on your training, or your circumstances permit it, give circuit training a shot. Remember that you don’t have to train with the comparatively light weights used by the weak and the elderly. And you don’t need their relaxed pace. There is no rule saying you cannot knock out a full set of incline dumbbell presses for 6 repetitions, then move on to a nice set of high-repetition leg extensions! The only rule in the gym is that you make the rules. Good luck, and remember that circuit training is just another tool at your disposal. This entry was posted in Training and tagged Circuit Training. Bookmark the permalink.